Keeping your old rigs and cannibalising them for parts on your new rigs, is probably the most powerful thing a rigger can do for productivity. 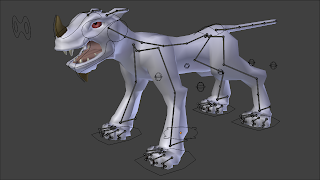 Which is how since yesterday ive managed to rig him almost completely. He's got all the usual bits and bobs, IK/FK switchable limbs, hinged head and FK limbs, lookats and so on. This project's mainly being done to have a nice simple quadruped rig to kick around. One little thing i have extra though is an extra roll bone and pole target on the back leg. 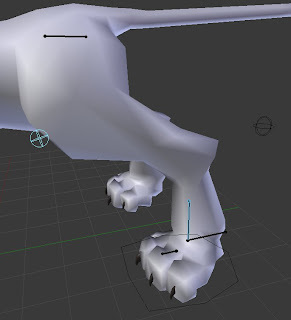 I've added them because a cat's skeletal structure has three bones on the back leg, as does the rig. So the extra pole target is to control the front knee, and the extra roll bone is to roll the leg between both of the knees. To have the second pole target i had to have two IK chains on the leg. The main one (pointed in red) targeting the IK foot as usual, and the secondary (pointed in blue) targeting the ankle bone of the main chain.. The pole target for the main chain (in red) is floating as usual, but to stop it getting to complicated, the pole target for the secondary (striped blue) is parented to its animatable bone pivoting from behind the knee (bone without shape shown in little window). Parented to the middle bone of the main chain and with its location locked, it will always sit just in front of the front knee. To get the leg roll was relatively simple after all that. 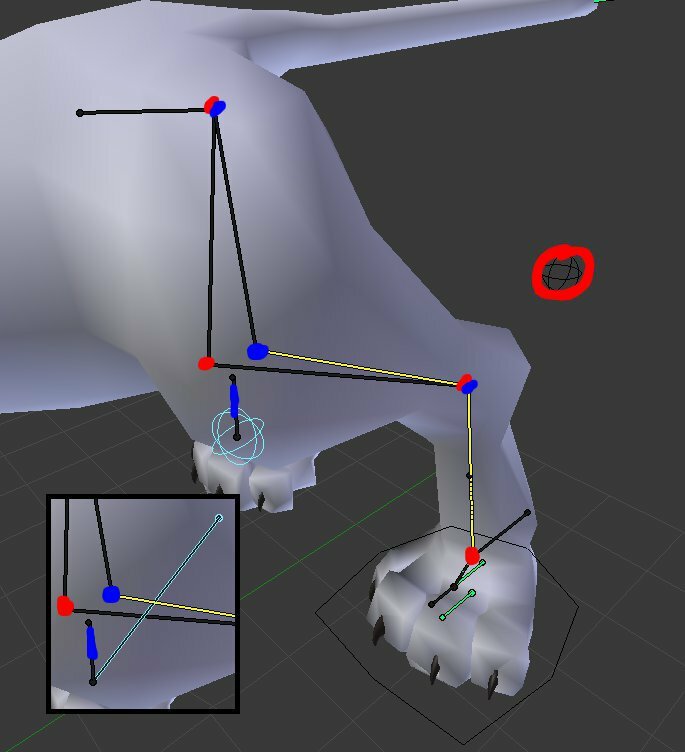 I created another bone at the same point as the ankle but flipped so it will rotate at the foot, parented it to the IK foot bone (same as the foot roll) then put a copy rotation (local space) on the last bone in the main IK Chain (also has the IK constraint). The IK/FK spine i was talking about in the last post isnt on there yet, been running into alot of speedbumps with that one. I can get it working to an extent where there is little to no control of the curve of the spine, not what i want. Using IK spline, im getting heeeeeeaps of cyclic dependencies, and when i dont have that im getting bone flipping. Till then heres a side by side of the sketch v pose to look at.